Raatz Fence Co. – Fence it right the first time! Fence it right the first time! Raatz Fence Company has been serving the community since 1971, working not only in the Kentuckiana. We provide servicing the entire mid-west as well. Our staff is made up over thirty-five individuals that take their work seriously. We stand behind our products and installations because we make sure our craftsmanship is top quality. We take pride in having a knowledgeable staff, keeping our crews well informed, and completing our jobs in a timely fashion. Raatz Fence Company has been a leader in fencing and access control systems since 1971. We pride ourselves in offering our customers the finest products and service in the fencing industry. We are continuously working to provide our customers with personal service that will make their fencing experience worry-free. 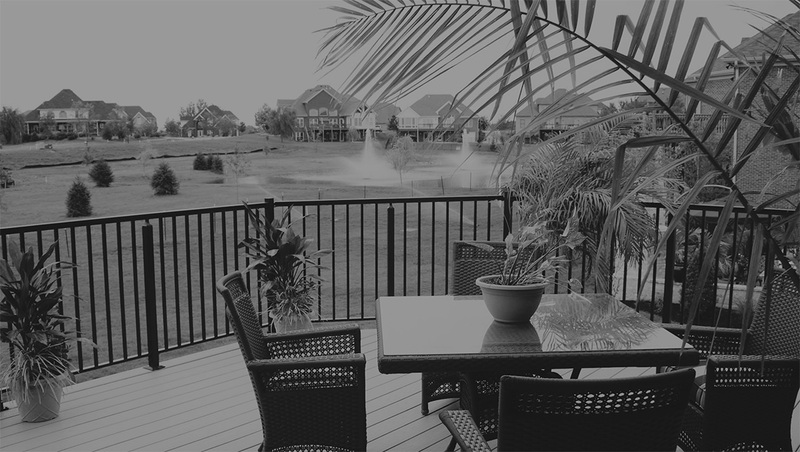 Raatz Fence Company is proud to offer Alumi-Guard's outstanding selection of maintenance-free, powder coated aluminum fences, gates, guardrails and handrails. Available in a wide variety of grades, styles, colors, and heights manufactured to withstand some of the harshest conditions. Providing Linear Pro Access and DKS gate operators, we can meet a wide variety of gate automation requirements. We offer residential and commercial fully customized solutions for unparalleled state of the art access control to your property. We stock and install numerous styles of wood fencing ranging from a traditional picket fencing to barrier fencing. We can also customize any style to meet your individual needs. Raatz Fence Company furnishes and installs Illusions vinyl fencing that is available in numerous colors and a large variety of styles. The lack of required maintenance makes it a great fence for homeowners as well as subdivisions and for commercial applications. Chain link is for property owners who need strength and protection. It defines property lines, and encloses animals, as well as protecting and adding value to all types of properties. When a permanent structure is not a suitable option, Raatz Fence Company provides galvanized chain link fence panels for your project. While mostly used for commercial construction, it is also great for remodels, public works projects, and events, both indoors and outdoors. We used this company on a prior home and service was exceptional. We used them again for our current home and service was exceptional again. Price is very good and install only took one day with tear down of our wood fence. They have a friendly staff, very knowledgeable on what type of fence would meet our needs and quality was excellent and would use them on our next home. Raatz Fence installed a pool fence on my property in October of 2017. Everything was PERFECT from the design work, the materials, the professionalism of the crew, and the clean grounds they left when the job was complete. I enjoyed working with the team at Raatz Fence Co and highly recommend their services! Excellent company from sales person to office staff to installers! Very professional, knowledgeable and courteous. Salesperson was on time and answered all of my questions. Cindy in the office was very helpful and polite. The installers came in explained everything re walked the installation with me so I got exactly what I wanted. They were both very polite when I asked questions before job was done to put me at ease. Fence and gate look very good. Good quality product. My fence is the envy of the neighborhood. Several neighbors have stopped and asked who built it for us. I have no hesitation recommending Raatz. Quick, professional installation of a great looking fence. They came, wrote the estimate, addressed my questions, and built the fence with in two or three weeks. I wish all contractors were this reliable. Outstanding customer service- great product. I can’t say enough good things about this company! If you need a new fence- CALL THEM! We are very pleased with the look of our fence and were able to get exactly what we wanted – 2 gates, safety, and function. They call 811 and have that set up, which is one less step for us. The bidder and installers, as well as the office staff, were phenomenal to work with. The pricing was reasonable and we were able to schedule the bid and the fence within a couple weeks of approval by our HOA. From the initial phone call, all the way to installation, Raatz was professional, honest, timely and very easy to work with. We had always heard about their sterling reputation so it was the first call we made when we wanted a fence for our brand new home. We didn’t need to make any other calls and I would suggest to you, if you’re in the market for a fence, DO NOT call anyone else other than Raatz. Seriously. It’ll be a waste of time and breath. They’ve done this thing for decades and there’s a reason they are still around when other competitive companies have floundered. Service and professionalism. They have both of those things in spades. Well done Raatz. Happy we did business together. Raatz Fence Company did an excellent job on a unique situation. I would use them again and definitely recommend them to others. Arrived on time, installed with high attention to detail, very competently done. Work site cleaned afterwards. I could not have asked for a better installation. I would definitely choose Raatz Fence again. Just pick up the phone or send us an email to schedule a consultation. With years of experience, there isn’t a fence situation that we can’t unlock. ​Call today!